StoryTel Foundation is pleased to announce our latest documentary is available for free via online streaming. Our film Miles Christi: Soldiers of Christ in America premiered one year ago today on EWTN. Since then it has been rebroadcast 18 times, in 75 countries and on 3 television networks, reaching over 260 million households. We've also distributed 840 DVDs of the program. The film's message of seeking God's will and pursuing personal holiness has already resonated with many audiences. But, since widespread distribution is a part of our mission, we want to ensure it reaches even more people. The entire full-length documentary is now available to watch on our Website and our YouTube channel. Catch the joyful, lively spirit of Miles Christi all over again and share it with everyone you know. As founder Fr. Yannuzzi says of Miles Christi in the film, "It's worth it." Our newly restored documentary about a dying parish miraculously restored to life is now available on DVD and will be broadcast to 230 million homes worldwide on September 25th. Watch our new trailer below to get a good feel for this newly restored and digitally remastered, time-tested documentary "Saint John Cantius, Restoring the Sacred". In the years following this program's premiere on EWTN in May of 2009, the fame of Saint John Cantius Church has grown and people everywhere have connected with our presentation of this amazing true story of how an all-but-abandoned huge, old church, destined for the wrecking ball, became a thriving religious and cultural treasure again. People are inspired by this production because it's well done and it's true; true to what actually happened and true to the spirit of those who worked with God to make it happen. It's a great story that we have structured a bit like an opera using the music from the choirs of Saint John Cantius to set and change the mood and to help drive the story forward. The story builds almost by itself as the production elevates liturgical beauty, appreciates Sacred music, and demonstrates how little things like making confession available during Sunday mass can have a profound impact on parishioner participation in the sacrament. Father Scott Haynes, SJC of Saint John Cantius has described this production as, "A powerful tool for our parish's revitalization and for the work of our religious community!" Father Haynes also called it, "A decisive tool for attracting vocations, a video that clearly proclaims who we are and what we do." During a review of this program, a few months ago, we began discussing how incredibly much video and audio technology has developed in the years since we originally shot this documentary, way back in the days of Betacam-SP video tape; and we decided it was high time we took advantage of our current technology to re-create this production in widescreen and bring all image and sound quality up a few notches. So we set to work restoring and remastering. We re-edited the picture into 4x3 widescreen; enhanced and re-mixed the soundtrack; re-created the titles and sharpened the still images; close captioned the whole production for the hearing impaired; dubbed it into Spanish to reach untapped markets; and basically enhanced all the visuals and audio wherever possible throughout the entire program, without altering any content along the way. 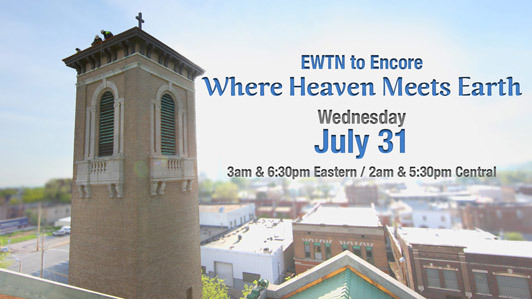 After 14 broadcasts dates on EWTN's seven English-language satellites spanning Africa and India; Canada; the United States; Europe; the Pacific Rim; UK and Ireland; totaling 75 individual English broadcasts, viewers are still calling EWTN to praise "Saint John Cantius, Restoring the Sacred" -- proof that Catholics around the world are entertained by this production and inspired to see the Sacred elements of our faith restored. In 2012, StoryTel released the Spanish-dubbed version of the Cantius story, "San Juan Cancio, La Restauracion de lo Sagrado", and since the Spanish program's premiere, "San Juan Cancio" has been televised on four separate dates to EWTN's worldwide Spanish-language channel. The Spanish and English "Saint John Cantius" productions together are currently reaching over 230 million homes throughout the world with 94 individual broadcasts from eight different EWTN satellites. Both versions are now contained on one DVD in the newly restored and remastered; widescreen; closed captioned; English or Spanish language; and enhanced audio -- "Saint John Cantius, Restoring the Sacred". If you haven't seen it, the story will delight you -- and if you have seen it before, you know you'll enjoy the experience of revisiting this timeless StoryTel story in the newly restored widescreen edition. If you enjoyed this page, Subscribe to StoryTel Updates and be the first to receive videos, trailers, and other exclusive content. 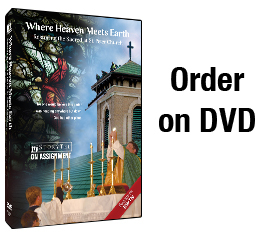 Where Heaven Meets Earth, World-wide Television Premiere on EWTNSaint Peter Catholic Church (St. Peters) of downtown Omaha, Nebraska will be featured in a documentary called, “Where Heaven Meets Earth." The film highlighting the story of St. Peter’s parish will appear on EWTN, Global Catholic Television Network on Tuesday, April 30, 2013 at 6:30pm ET. The documentary, a $100K film project, produced and donated by StoryTel Foundation, investigates how this poor Omaha parish became a thriving and vibrant community again after more than 40 years of decline. Originally built in 1886, Saint Peter Catholic Church grew to become one of the biggest and busiest parishes in the diocese of Omaha, Nebraska. But in the 1960s, huge chunks of the neighborhoods north and south of the church were razed to make way for the construction of interstate 480, forcing hundreds of parishioners to move away from St. Peters. In the years that followed, more and more parishioners moved west to the suburbs, St. Peter’s school closed, and the resulting lack of donations led to years of deferred building maintenance causing the church to fall into disrepair. By the time a young priest on his first assignment as pastor arrived in 2004, no one would believe this place would survive let alone thrive, but Father Damien Cook was inspired with an idea that would prove God had other plans for Saint Peter Catholic Church. Created to entertain viewers around the world with an incredible, true story and spur them to action for God, the film has incidentally helped the parish raise $3 million and is expected to raise even more when it airs on EWTN, though it wasn’t intended to be a fundraising video. It is one of the many projects recently completed by StoryTel, a private non-profit media foundation, as part of their mission to, “inspire viewers to restore the sacred,” says President of StoryTel and “Where Heaven Meets Earth” director, Don Carney.